I followed in the ox-wagon tracks of the Great Trek through Jock of the Bushveld country along the Panorama Route three times in the last year. 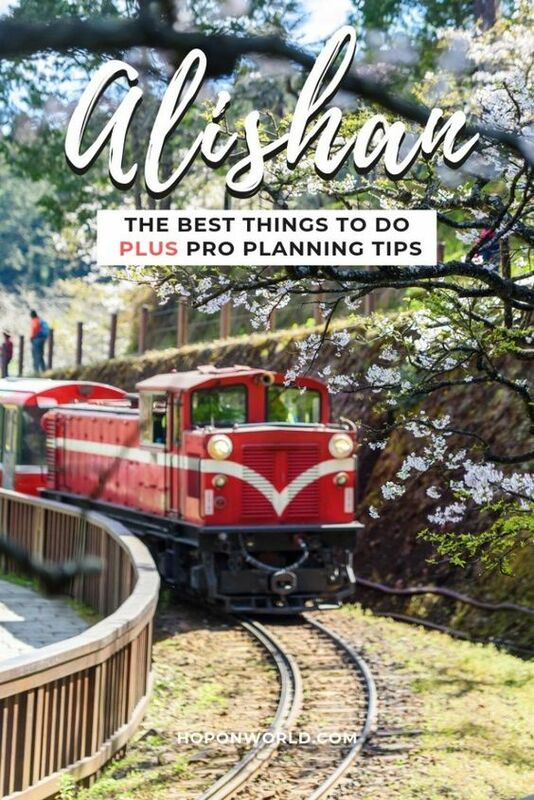 I wrote about my highlights for Travel Ideas magazine. 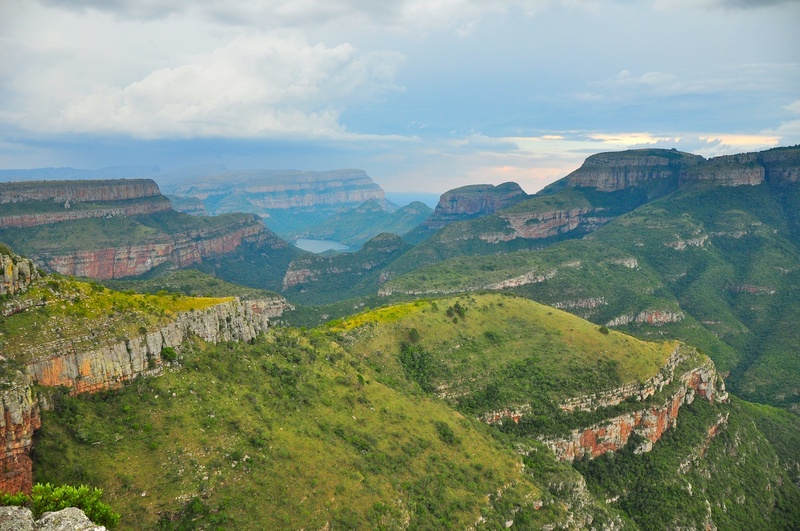 Before you head out on a road trip along the high plateau grasslands of Mpumalanga’s Panorama Route – which ribbons its way for over 130km from the Graskop region to the Three Rondavels and beyond – make sure you have enough memory space and battery power. Take my word for it, this is no idle reminder. 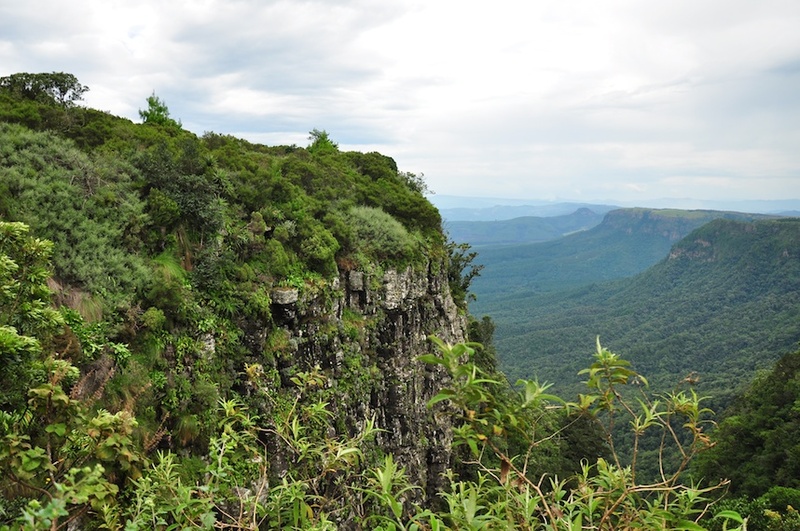 Mpumalanga province, which shares borders with Swaziland and Maputo, has much to lay before visitors in terms of natural wonders, age-old stories and cultural sites. Yet, the Panorama Route is possibly its greatest attraction and certainly the most visited. 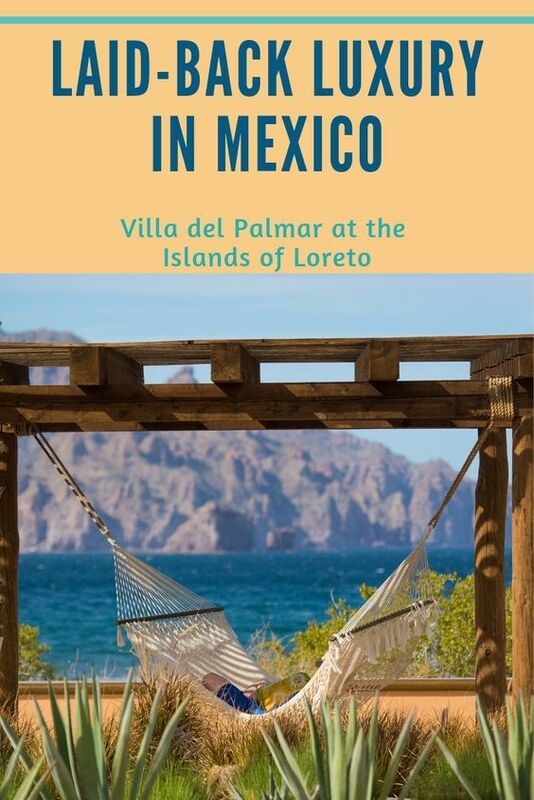 So give yourself at least four days to explore the region at your own pace. 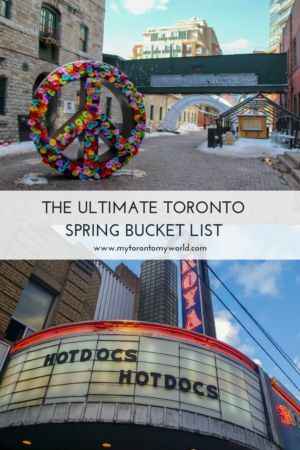 While there are many fascinating stops along the way, these are the ones you shouldn’t miss. At 1 493 metres, Graskop is the starting point of our road trip. If you’re driving west along the R533, half an hour from Graskop is the historic gold mining town of Pilgrim’s Rest. It was declared a gold field on 22 September 1873 as gold fever gripped the region. By the end of the year it had attracted around 1 500 gold prospectors with their sluice boxes, in search of alluvial gold along the banks of the creek. By 1880, R2 million worth of gold was rumoured to have been found. Around 300 000 tonnes of ore were mined annually between 1930 and 1950. But by 1972 gold fever loosened its hold as mining activities ceased and attention turned to discoveries of gold reserves elsewhere. As I walk up the main street, that’s flanked by Jacandardas, I imagine what life may have been like in the early days of the nineteenth century, when the Gold News was at its printing prime and barmaids served drinks at the local pub, until the town’s last ‘golden’ Jacaranda bloom fell. As there is no ATM here – there are card machines though – it seems that gold would be an appropriate legal form of tender. Today, Pilgrim’s Rest is a protected provincial heritage site and living museum that caters to tourists wanting a window into the past. Many of the heritage buildings have been converted into restaurants, coffee shops and curio stores that sell trinkets related to the region. Just about everyone has heard of the Robber’s Grave at the cemetery, near the Methodist Church – if you’re easily scared, visit by daylight. 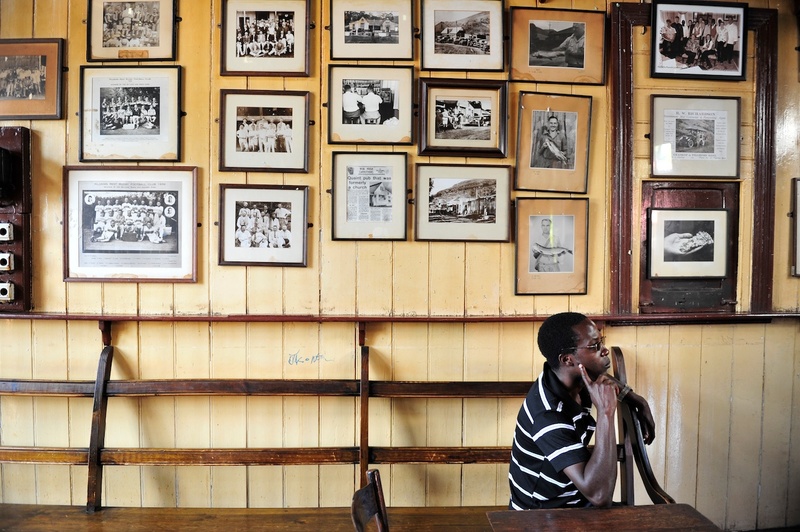 Ask to see the bar at the Royal Hotel, which was a chapel before it was dismantled and shipped from Cape Town via what was then Delagoa Bay (today’s Maputo). 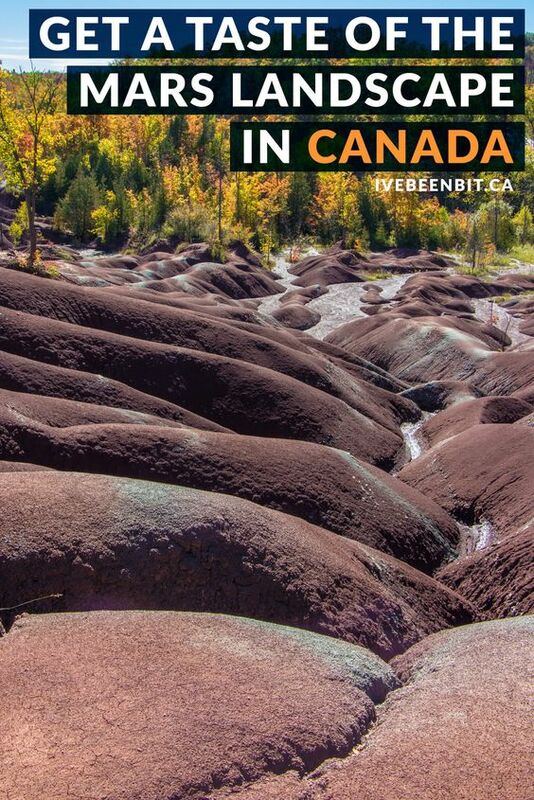 You can also grab a sluice box and try your hand at gold panning, or partake in the annual gold panning championships each September. Although Pilgrim’s Rest has lost some of its lustre since its heyday and has become commercialised some would say; it’s still interesting to suspend yourself in time on a visit to Alanglade House Museum. 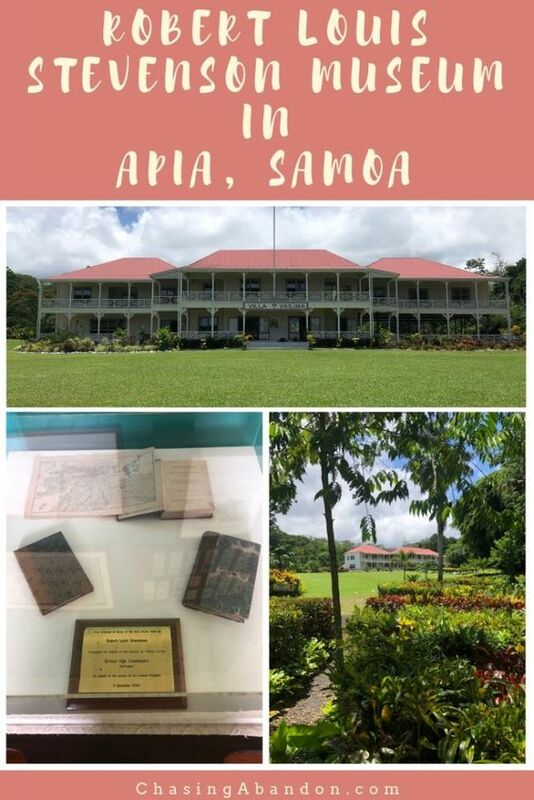 It was built in 1915 for the family of a British mining manager and is furnished with decor from the 1900s. And the prices seem to be stuck in the past too, as a ticket only costs R20. We buy bags of roasted macadamia nuts tossed in peri-peri seasoning from the friendly street side vendors before heading out again. Pass Graskop along the R532 and take the loop road right (R534) to Pinnacle Rock, a lone 30-metre high quartzite column, overgrown with aloes, which resembles an index finger, that stands encircled by the indigenous forest of the surrounding Driekop Gorge. From here the Ngwaritsana River crashes down into the unseen. God’s Window further along the road offers panoramic views of the Lowveld valley below, the Kruger National Park in the distance and the Lebombo Mountain range on the horizon. Its natural beauty and high elevation (900m) is imagined to have found favour with God, who given the choice would have settled here. Here you can peer over the escarpment’s edge. If you arrive at God’s Window while the day is still young, you may be able to walk among the clouds along the wooden walkway through the forest to the look out point. Next up is Wonder View – the highest viewpoint along the Panorama Route at 1 730m – there’s no walking required here as the 360 degree panoramic views of the surrounding peaks and plateaus can be seen from the roadside. Back on the R532, Lisbon Falls is on your left. 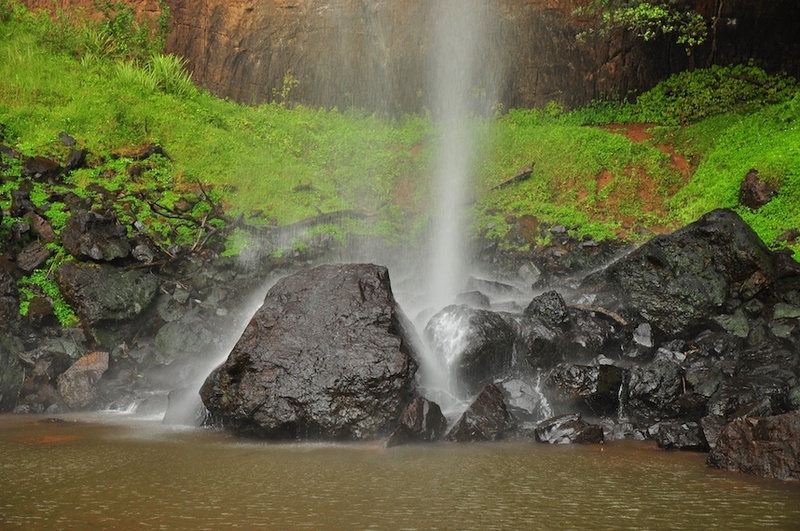 This trebel waterfall cascades for 95m into the pools below. Further up the road (also on the left) is the smaller though no less intriguing Berlin Falls, where the Watervalspruit plunges down a 80-metre high cliff. Don’t miss the view from the viewing deck and if you’re hungry, there are picnic sites too. I buy an ornamental hippo pool that’s carved from stone and completed with a bonsai tree. After a long stretch of open road along the R532, lunch at Potluck Boskombuis. Keep a look out for the sign on your right hand side en route to the potholes. Now, you won’t hear me wax lyrical about food often, but if every TripAdvisor review of this place contains the word ‘best’ in the title, you know I’m not far off. This is the place for a taste of local cuisine – they serve boerewors, T-bone steak, chicken kebabs, potjiekos, mieliepap, sheba, as well as a vegetarian bake. All meals come with a side dish of unsurpassable views. We sit on tree stumps at wooden tables as our food is served on tin plates to the views of the babbling Treur River and surrounding bushveld. Nearby are the giant cylindrical potholes at Bourke’s Luck Potholes. 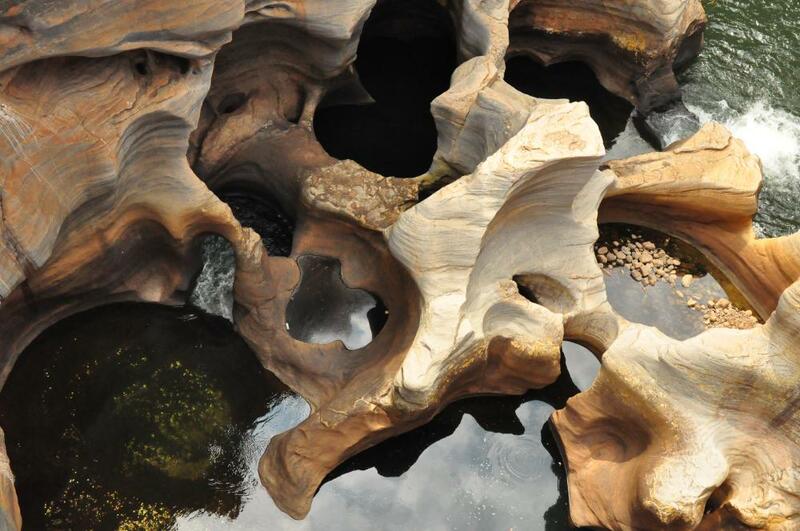 They have been carved over millions of years by sand and rocks swirling around in the rock pools where the Blyde (meaning ‘joy’ in Afrikaans) and Treur (meaning ‘sorrow’ in Afrikaans) rivers meet. 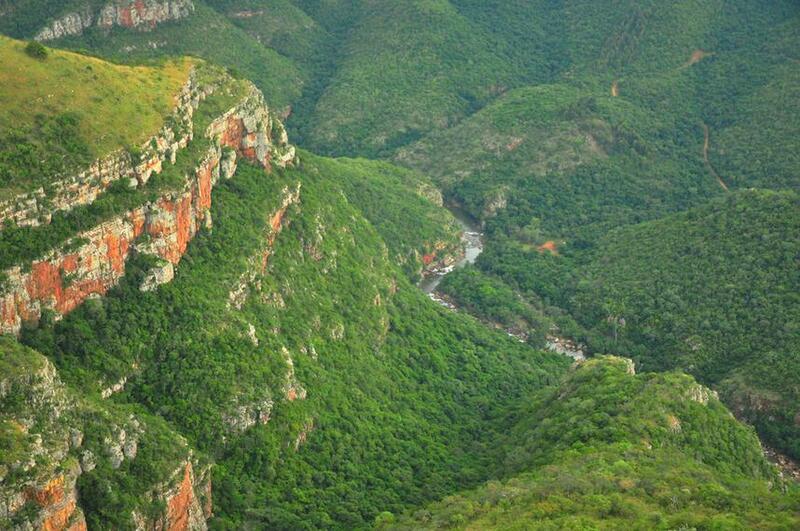 This geological phenomenon marks the beginning of the Blyde River Canyon. Bridges and lookout points stretch over the expanse of the rivers. The potholes are said to be named after Tom Burke, who realised the gold potential in the region. However, there’s an element of irony in their name, as the main gold reserve was not found on his property, but on the opposite side of the river. To conquer the heat, we buy ice-cream from the cafe. Adrenaline junkies can obtain a hiking permit and map from the office. The trail starts and finishes at the Bourke’s Luck Visitors Centre. 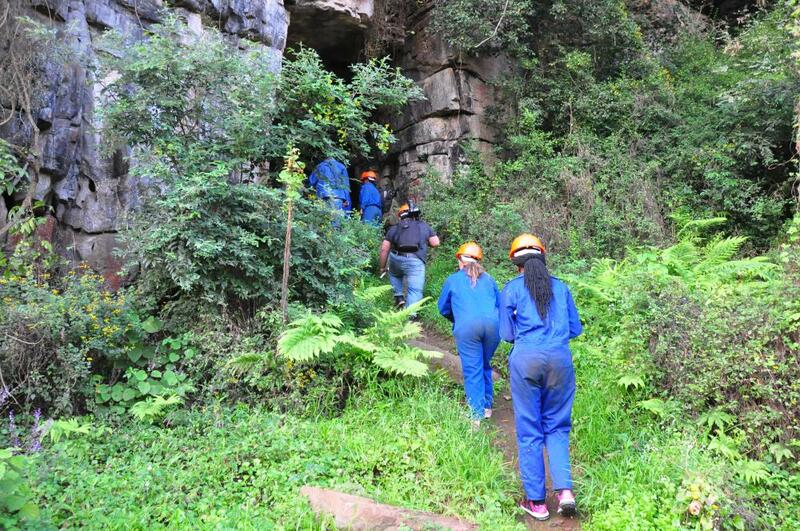 The route follows the Yellowwood Trail, passes the potholes and then descends into the Blyde River Canyon to the power station. Because of the steep slopes one should be fairly fit to tackle this trail. 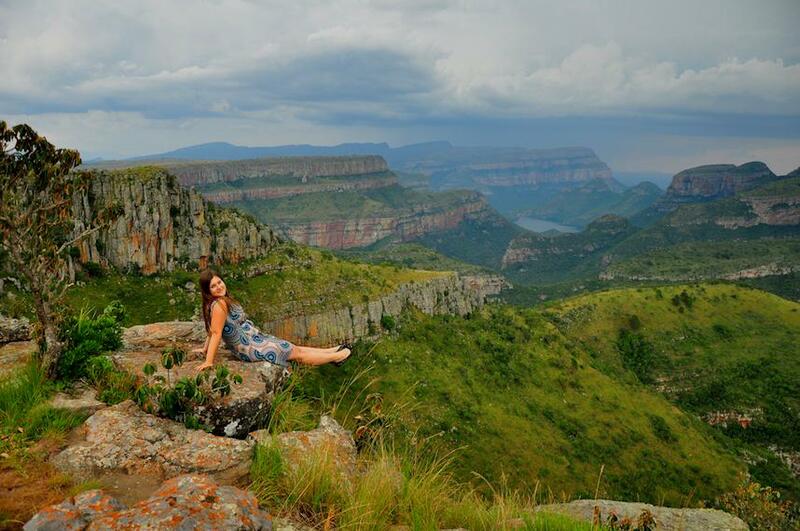 And now for the main reason we’ve come all this way along the Panorama Route – the Blyde River Canyon, also known as Motlatse, which means ‘a river that is always full’ in the Pulane dialect of Northern Sotho. The canyon is found within Motlatse Provincial Nature Reserve. 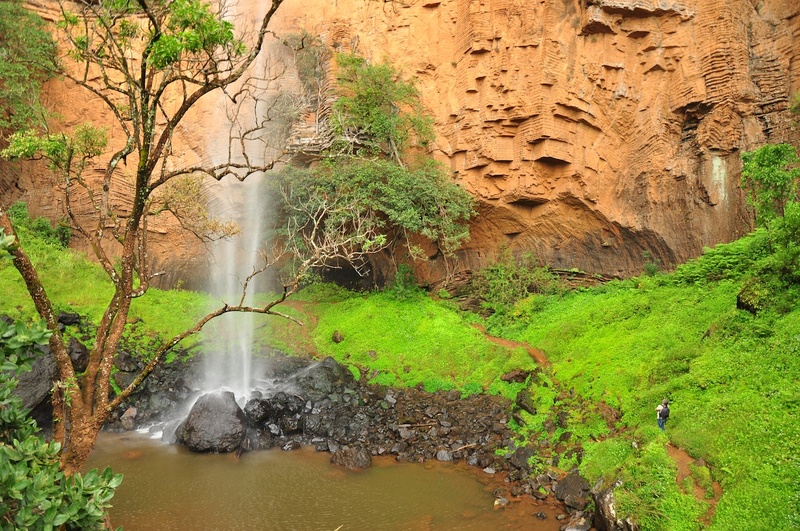 Its lush subtropical foliage makes it the world’s greenest canyon. The crags of the canyon stretch for over 26 kilometres and it’s 800 metres deep, making it the world’s third largest canyon. It’s the second largest in Africa, after Namibia‘s Fish River Canyon. This is South Africa‘s fourth most-visited tourist attraction as around one million visitors make their way here each year. The photographs speak for themselves. We precariously sit on the edge and dangle our feet into the depths below. Eagles circle overhead. The view site at the Three Rondavels offers picture-book views of the famous quartzite and shale peaks that resemble the traditional rondavel houses with domed roofs that are covered, as if with icing sugar, in green. The three peaks are said to be named after three of Chief Maripi Mashile’s wives: Magabolle, Mogoladikwe and Maseroto. From here we photograph the Blydepoort Dam. We end off our trip with a stay at Misty Mountain in Sabie in the southern part of the Panorama Route. It overlooks a valley of pine trees shrouded by mist on most mornings. 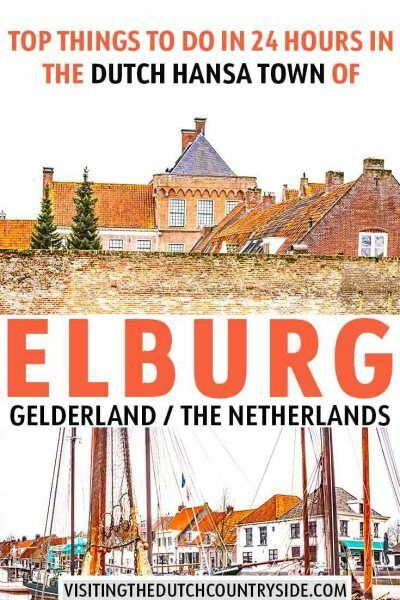 You could easily spend two days exploring the area as there are many excursions and much to keep families busy. This is the place to try trout, which the region is famed for. There was a day when I ate it for breakfast, lunch and dinner. 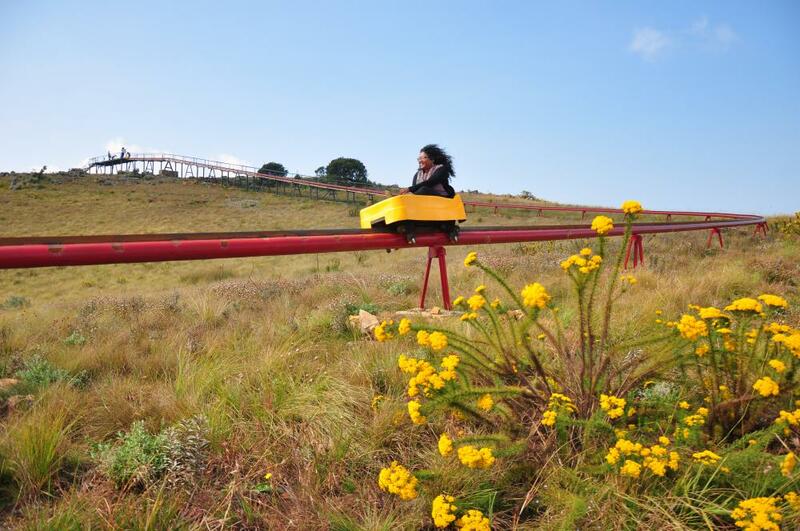 Misty Mountain opened South Africa’s first toboggan ride in March 2016. We climb into a 4×4 to make our way to the top of the hill, where we climb into the single-seater cart. It gains momentum as it slides down the metal railing. It reaches speeds of up to 40km/hour as it hurtles down the mountain over a distance of 1.7km. I have the sensation that I am on my very own roller coaster and that I may tip out on the corners, but the seat belt keeps me in place and I try not to use the hand-held break too often. Later we don blue overalls and ditch torches in favour of candles as we go caving my candle light in the Echo Caves. Our guide Kestell Barnard, from Kestell Adventures, and his trusty dog, Wouter, show us the way through the muddy, underground tunnels. Kestrel explains the cave system as we take in a breath to squeeze our way through tight tunnels, crawl across the muddy ground, and slide down on out buttocks. Once in the biggest chamber, we blow out our candles and sit in silence for a minute. 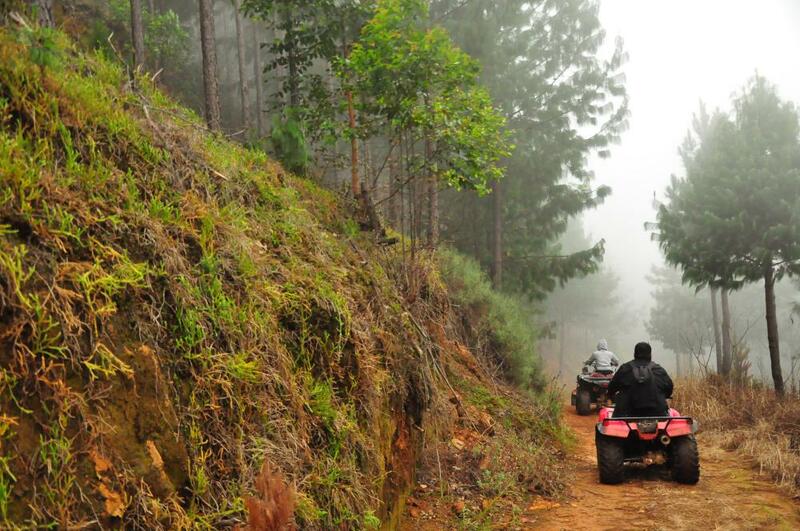 Those with a love of speed can keep the adrenaline flowing by going quad biking through the pine forests that surround Misty Mountain. On this particular morning the fog hadn’t yet dissipated and whirled between the trees. It was an exciting pre-breakfast excursion that woke us up for the day ahead. 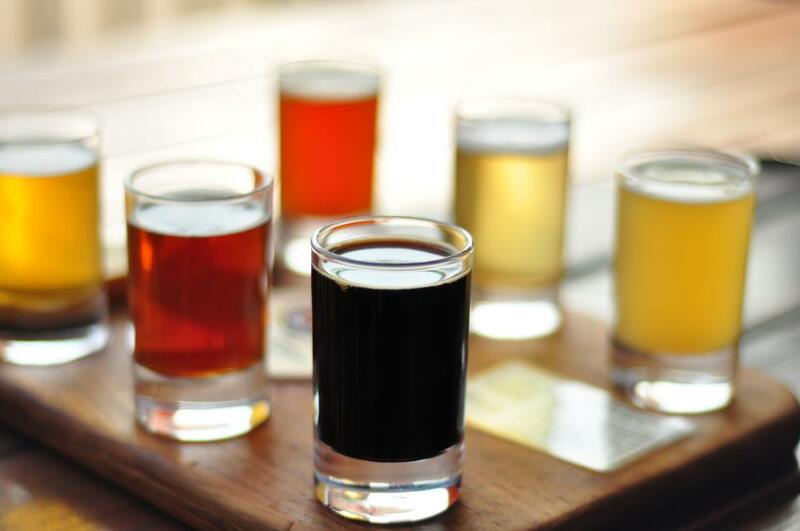 But no matter which activities you choose to do, finish your day with a brewery tour and beer tasting at Sabie Brewing Company in town. The microbrewery, which is located in a heritage building, has six beers to choose from. Try a taster palate to decide which beer you’d like to enjoy with your lunch (I had a salmon trout salad). 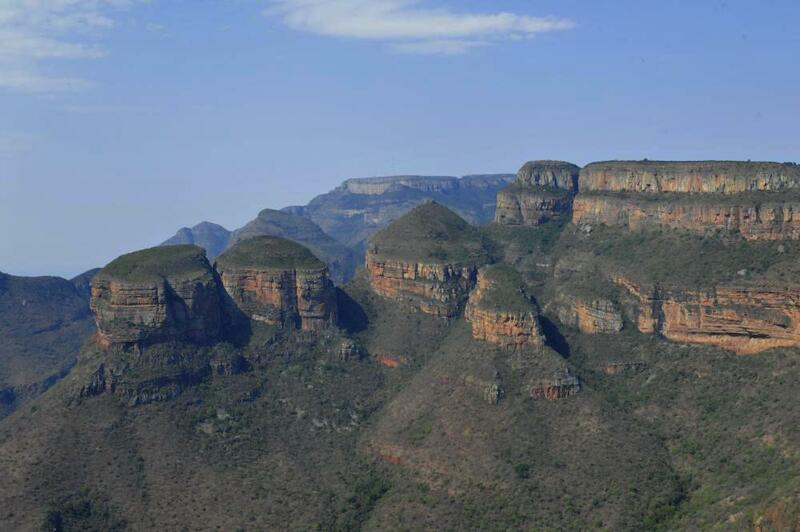 Then cheers to your epic Mpumalanga road trip along the famous Panorama Route. 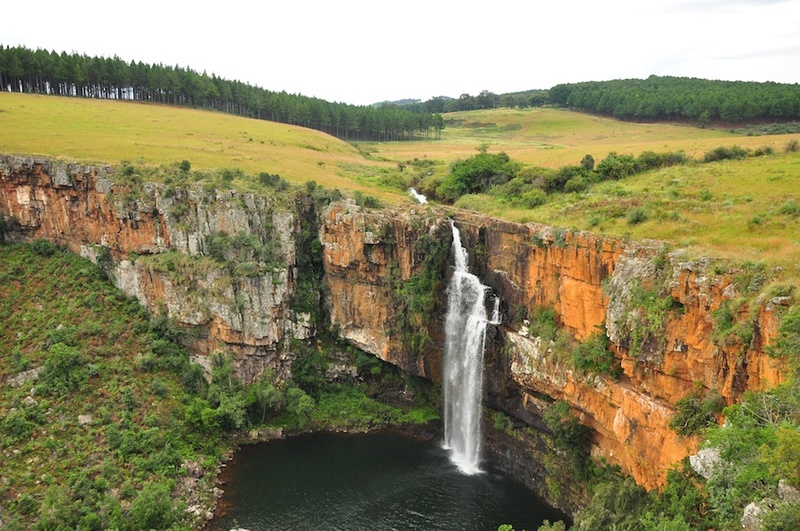 Just south of Sabie is Bridal Veil Falls – the most scenic of the many waterfalls along the Panorama Route. The 15-minute walk through the verdant rainforest is enough to get the blood flowing. I emerge from the thicket of twirling branches and creepers to be faced with a burnt orange sandstone cliff face. The water splashes in all directions as it tumbles 146m over the lip of the cliff into the lake below. Take a few steps back to get the entire length of the waterfall in your viewfinder. Can spot my dad gazing up at Bridal Falls? 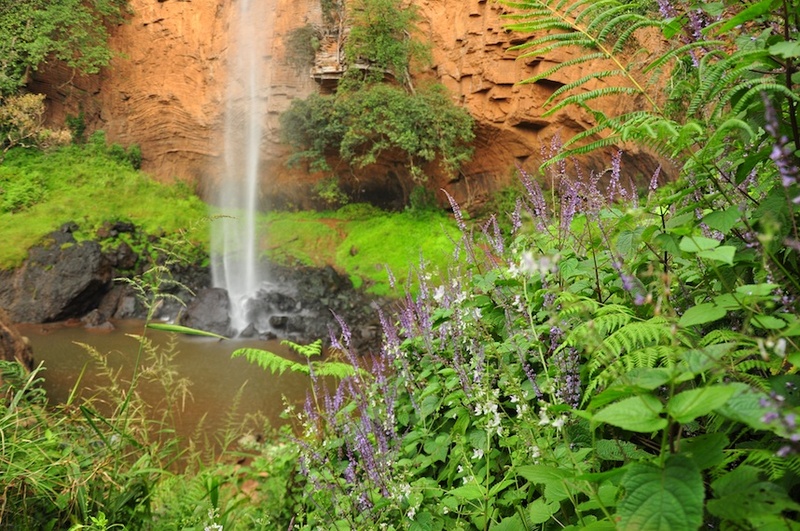 If you’re brave enough – rather, if you’re wearing your swimming costume or have a spare set of clothes to change into – you can walk along the thin, red-earth path behind the waterfall and watch its waters plunge in front of you. Then sit on a nearby rock as you take it all in. These certainly aren’t all the stops along the Panorama Route as there are so many. Did I leave out any of your favourites? Please tell me in the comments below. Great info for Stonecutters Lodge guests. 4* Lodge not far from the beginning of the Long Tom Pass. 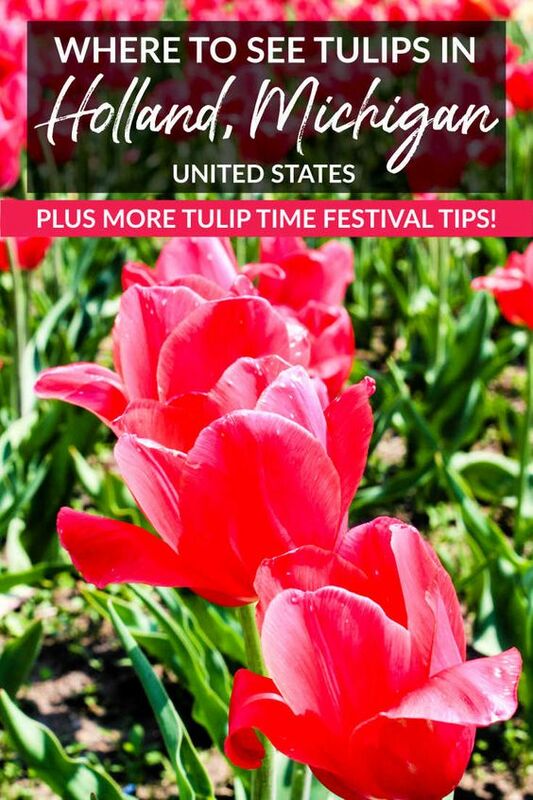 Visit us sometime! Great, I am happy to hear that you found it useful. Please do share it with your guests. :) Will drop by to say hi when I am next in the area. 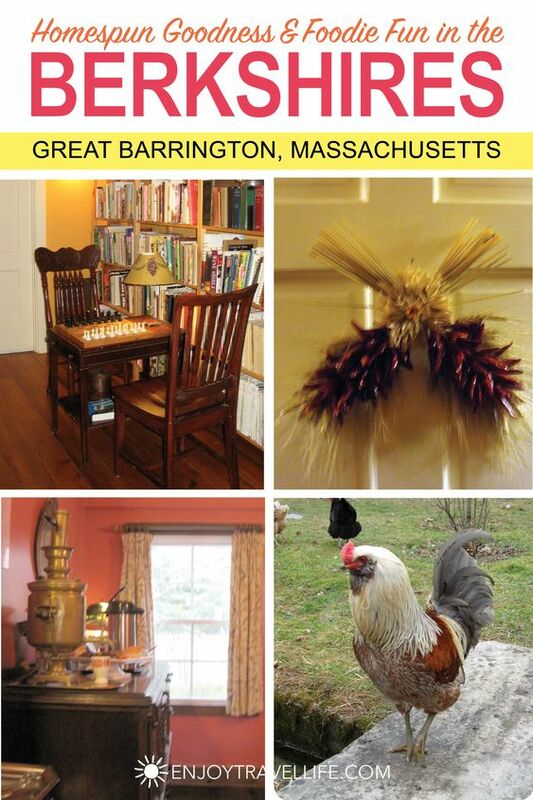 Marvelous images (and prose). I am absolutely drooling! Thank you very much Caroline, that means a lot coming from you. :) It’s such a beautiful region of our country.